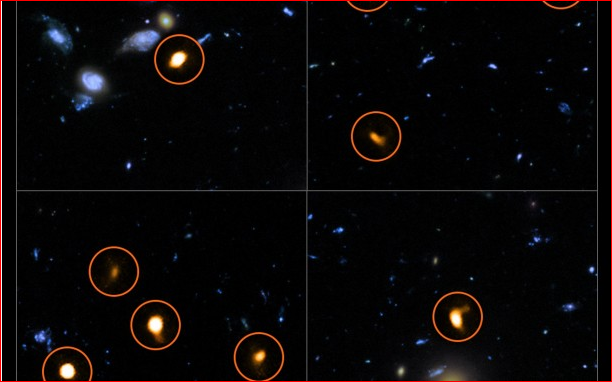 These cutout images are from a combination of a background picture taken by the NASA/ESA Hubble Space Telescope (blue/green) with a new very deep ALMA view of the field (orange, marked with circles). 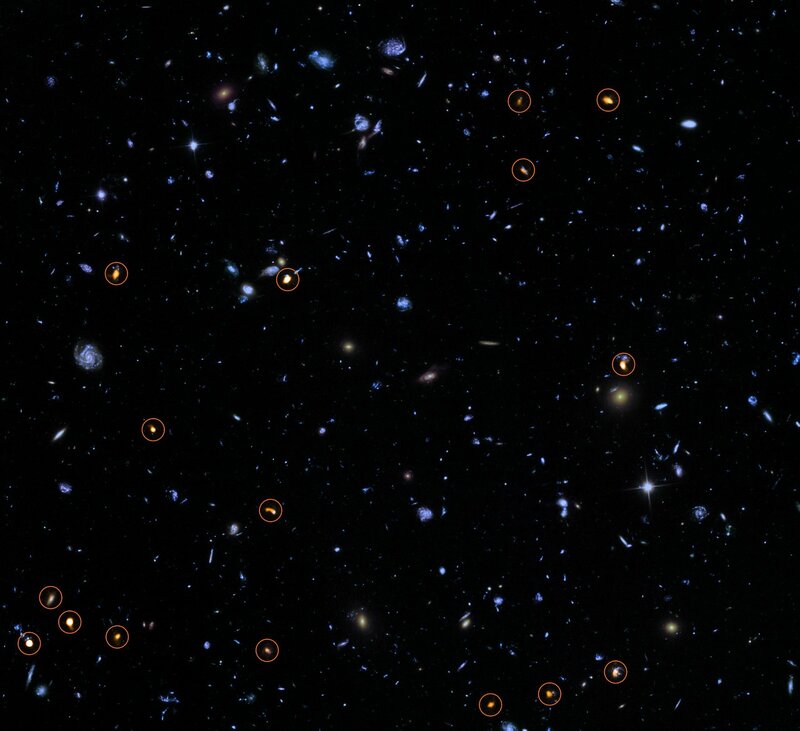 All the objects that ALMA sees appear to be massive star-forming galaxies. This image is based on the ALMA survey by J. Dunlop and colleagues, covering the full HUDF area. Credit: ALMA (ESO/NAOJ/NRAO)/NASA/ESA/J. Dunlop et al. and S. Beckwith (STScI) and the HUDF Team. 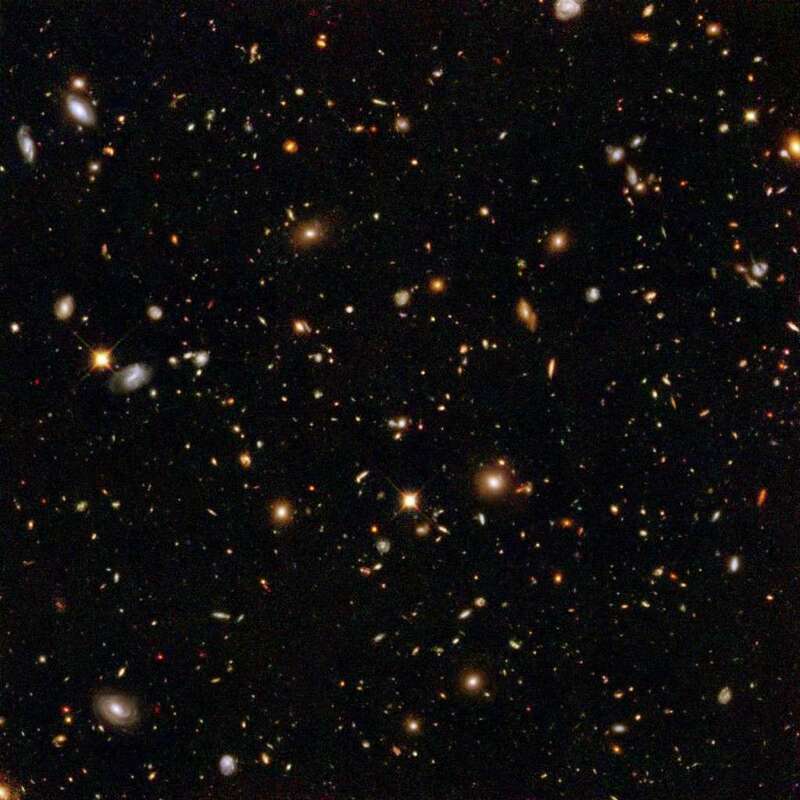 Abstract: We present the rationale for and the observational description of ASPECS: The ALMA SPECtroscopic Survey in the Hubble Ultra-Deep Field (UDF), the cosmological deep field that has the deepest multi-wavelength data available. 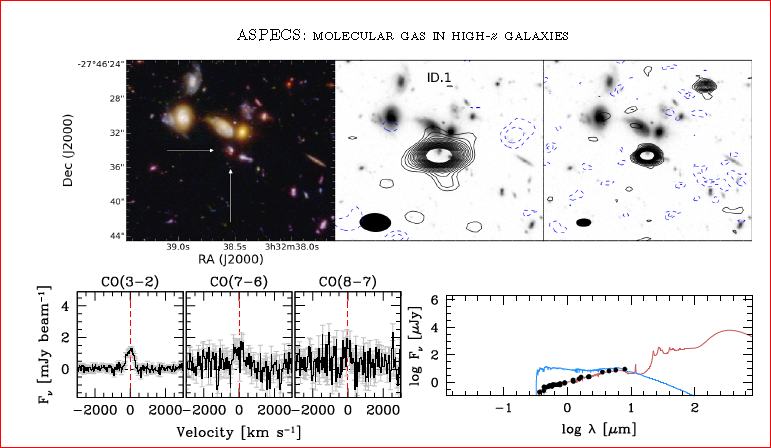 Our overarching goal is to obtain an unbiased census of molecular gas and dust continuum emission in high-redshift (z> 0.5) galaxies. The ∼ 1 [size=16]′ [/size] region covered within the UDF was chosen to overlap with the deepest available imaging from HST. Our ALMA observations consist of full frequency scans in band 3 (84-115 GHz) and band 6 (212-272 GHz) at approximately uniform line sensitivity (L [size=16]′ CO ∼ [/size] 2× 10 [size=16]9 [/size] K km/s pc [size=16]2 [/size] ), and continuum noise levels of 3.8 μ Jy beam [size=11]−1 [/size] and 12.7 μ Jy beam [size=11]−1 [/size] , respectively. The molecular surveys cover the different rotational transitions of the CO molecule, leading to essentially full redshift coverage. The [CII] emission line is also covered at redshifts 6.0<z<8.0 . We present a customized algorithm to identify line candidates in the molecular line scans, and quantify our ability to recover artificial sources from our data. Based on whether multiple CO lines are detected, and whether optical spectroscopic redshifts as well as optical counterparts exist, we constrain the most likely line identification. We report 10 (11) CO line candidates in the 3mm (1mm) band, and our statistical analysis shows that < 4 of these (in each band) are likely spurious. Less than 1/3 of the total CO flux in the low-J CO line candidates are from sources that are not associated with an optical/NIR counterpart. We also present continuum maps of both the band 3 and band 6 observations. The data presented here form the basis of a number of dedicated studies that are presented in subsequent papers.